"The moon blew up without warning and for no apparent reason." As opening lines go, the lift-off of Neal Stephenson's new near-future space opera is a good predictor for what is to follow. 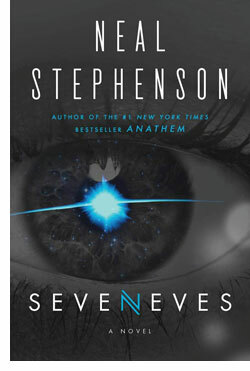 'Seveneves' is a big book in every sense; it clocks in at over 800 pages, the events are momentous, the all-too-real characters confront apocalypse, and the ideas are authentically astounding. But don't let its size fool you. This is a page-turning thriller that you're likely to finish all too quickly. It's the epitome of both classic science extrapolation and post-cyberpunk transhumanism. Don't just hold on to your seats; hold on to your brains. The two-part plot is both simple and extremely satisfying. In the first part of the novel, Stephenson crafts a very clever scenario by means of which we are impelled to create a classic "space ark" to save humanity. He sets the first part of the novel in "day after tomorrow" territory, so the technology available to do so is pretty much what we have at the moment, with a bit of build-out. This comprises about two-thirds of the book,, and it's a gripping ripping yarn. Be prepared to stay up late, and enjoy the echoes of Arthur C. Clarke. The final third of the novel jumps 5,000 years into the future, as humanity returns to earth. Here, the process of discovery is almost inverted, as a great deal of the fun to be had involves in understanding how the events of the first part of the novel create and the characters for the setting for second part. It's a thrilling exploration of humanity, space travel and the earth itself, all re-imagined through the lens of the first part of the novel. Driving Stephenson's plot are a wonderful group of characters; funny, realistic nd smart enough to deal with what Stephenson is handing out. Much of the first part of the novel is driven by the dynamic between two female characters, Dinah and Ivy. They're both on the Space Station, and the interplay between the two just feels right. Led by Dubois Jerome Xavier Harris, AKA "Doob," the men fare equally well. Stephenson sets up some engaging conflicts in the present and the future, but steers clear of true "villains" with a more rounded vision of people. His characters keep their feet on the ground even when they are in or even from outer pace. Stephenson's prose is, as ever, crystalline and transparent when he's talking technology or building worlds, crisp when he's in character and understatedly poetic when he is crafting sense of wonder. The humor here really helps. But there's a great deal of technology in the book, and Stephenson really knocks it out of the park in these segments. He's a man who can glue your eyes to the page with gripping revelations of logic and science. Here, he gets to the literary core of the science fiction genre and shows himself to be a master. Readers looking for a book that will take them out of this world, will deliver on thrills, will boggle their mind with big ideas are going to be very happy indeed with 'Seveneves.' It's a book about the future that gives you hope for the future, and not just by virtue of the believable world it creates. If we can write books like this now, there's hope that no matter what happens, tomorrow will be survivable, and maybe better.